I am writing on behalf of United Against Police Terror San Diego to indicate our full support for Senate Bill 124. SB 124 would: 1. Clearly define solitary confinement – (also known as isolation) – for county and state juvenile lock-ups as confinement in a locked room (dormitory) typically used for sleeping or in a locked cell; 2. Limit the use of solitary confinement to four hours; 3. Eliminate its use as a punishment, group punishment or for youth who have mental conditions; and 4. Require facilities to exhaust all other interventions before confining a youth to solitary confinement. The law would apply to all county juvenile halls, county probation camps and ranches, and the California State Department of Corrections and Rehabilitation’s youth prison system known as the Division of Juvenile Justice. California has some of the nation’s harshest conditions in juvenile facilities – including widespread use of solitary confinement – causing lifelong trauma for the youth and families who are impacted. Studies have shown that youth who experience solitary confinement are more likely to spend time in adult prison, less likely to finish high school, more likely to develop mental illness and/or drug/alcohol addictions as a result of the harsh conditions and sensory deprivation of solitary confinement, and are more likely to attempt or commit suicide. In the San Diego CityBeat publication Wednesday, February 4, 2015 “Legislation seeks to end isolation in juvenile facilities” Kelly Davis reports In November, CityBeat wrote about 16-year-old Rosemary Summers, who was found hanging in her room at the Girls Rehabilitation Facility in Kearny Mesa on Sept. 27, 2013. According to records obtained by attorneys representing Summers’ parents in a lawsuit against the county, the teen struggled with depression and panic attacks that were especially acute after she was moved into a single room, where staff reported hearing her talking to herself. In one instance, when Summers refused to return to her room because of severe anxiety, she was punished with 48 hours of room confinement. In honor of Rosemary and all youth affected, please pass SB 124. 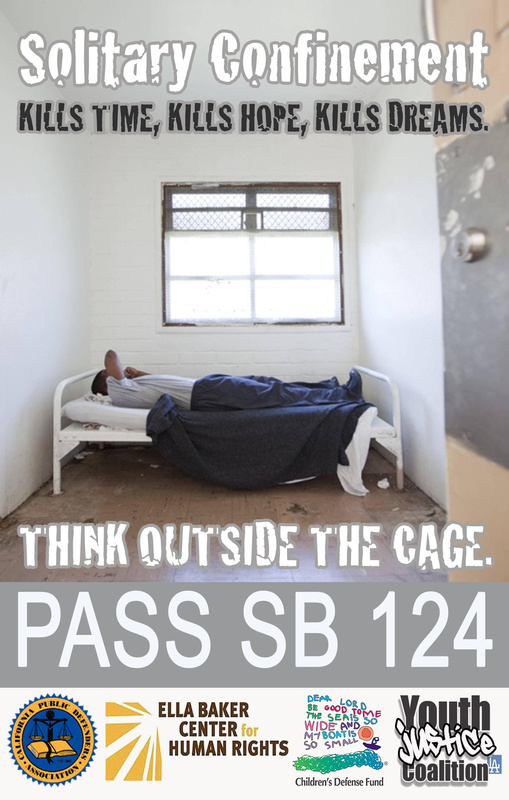 Unless we pass SB 124, across California, thousands of youth, their families and loved ones will continue to experience solitary confinement each year. Authored by Senator Mark Leno and co-sponsored by Ella Baker Center for Human Rights, the Youth Justice Coalition, the Children’s Defense Fund – California, and the CA Public Defender’s Association, would drastically limit the harmful practice of solitary confinement (also known as seclusion and isolation) of youth in juvenile facilities. This includes all juvenile halls, probation camps and ranches and the state’s Division of Juvenile Justice youth prison system. The use of solitary confinement would not used for punishment, but only if the youth poses a serious and imminent threat to themselves or others, that isolation be used only after all other interventions have been exhausted, and that the practice be limited to 4 hours.